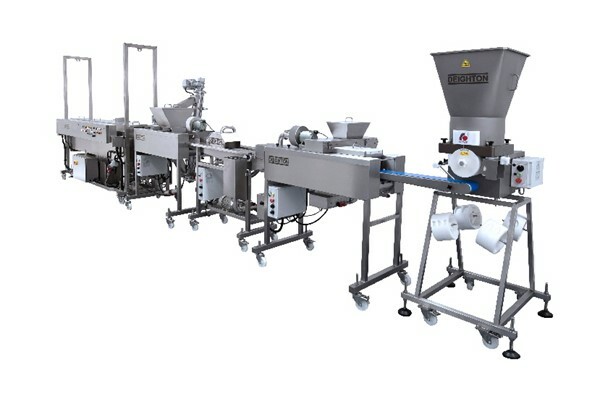 The Econo range of equipment fills a long vacant hole in the Australian and New Zealand market place by providing a serious and robust 200mm batter, bread-crumb coating line and 200mm electrically heated fryer, as well as conventional sizes of 300mm (US1ft), 400mm and 600mm widths. As with the well-known Formatic forming machines, the Econo range is built in the UK, and strongly with longevity in mind. The construction of the machines is of stainless steel and with the IP67 electrical control boxes, are entirely water hoseable for cleaning. 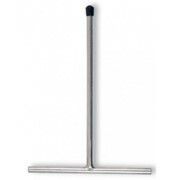 The EconoRobe is the batter applicator and is simplicity itself. 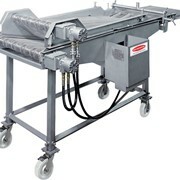 The product is carried under the batter pool by an adjustable height hold-down conveyor. There is no curtain or pumping and so the EconoRobe is entirely suitable for Tempura as well as batters without fear of thickening. An adjustable air-knife blows off excess batter before the transfer to the crumbing machine. The product is transferred onto a bed of crumb on the EconoCrumb machine and carried under a crumb curtain. The top hopper has an adjustable curtain gate for application of the top layer of crumb and this, as well as the thickness of the crumb bed, is controlled by a simple slide gate at the auger return. 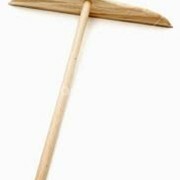 The auger is inclined at an angle which - Insures the crumb falls quickly to the flights Makes for easy emptying and cleaning The auger remains fixed to the machine and features a full length access door which opens an entire half of the auger and allows the crumb to fall to the collection bin rather than requiring sweeping and/or air blowing. A double flight on the auger base insures fast pick up of the crumb away from the entry point to minimise crumb damage and breakdown. The bottom chute to the auger releases for removal easily with a clip release and the front end of the conveyor (crumb bed forming) is easily accessed by a hinged cover. 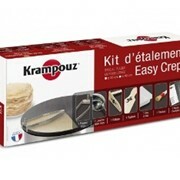 The product exits the curtain and passes under a soft roller to lightly press the crumb into the batter, after which the product passes under another air-knife with enclosure curtains to blow off excess crumb and return the crumb to the crumb bed and auger. The EconoFryer is electrically heated with immersed elements for the most efficient heat transfer. As this method imparts 95-98% of the heat directly to the oil, it has a far greater efficiency than gas fired fryers which can only achieve at best a 66% efficiency for heat transfer. This negates the occasional argument that gas is a cheaper supply than electricity in many areas. 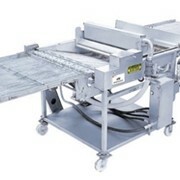 The fryer includes a hold-down conveyor as standard and has as standard also the traditional wire belt inclined infeed. A Teflon-coated infeed is available for Tempura type products where the belt can be laid flat in the fryer or raised to provide an inclined feed if required – a neat "double duty" infeed option. For more information or a quote please call or email using the form for a fast direct reply.